On January 31, the Alice M. Ditson Fund of Columbia University awarded a grant of $3,000 to support The Walden School Faculty Commissioning Concert. The concert celebrates Walden’s faculty as world-class artists and composers, writing for and collaborating with some of the foremost ensembles in the world to bring world premiere music to the concert stage. 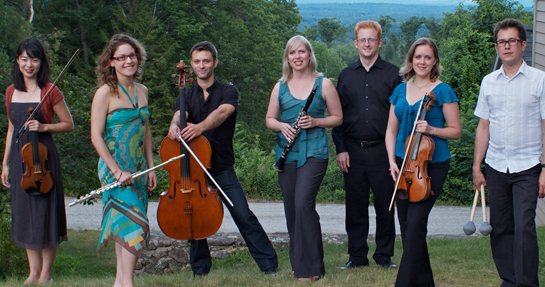 Ensemble Dal Niente will be the ensemble-in-residence for the 2019 Faculty Commissioning Concert. 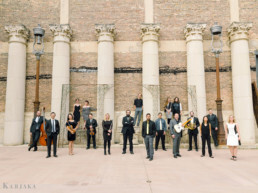 With a roster of 23 exceptional musicians, Dal Niente performs new and experimental chamber music with dedication, virtuosity, and an exploratory spirit. Four members of Dal Niente will spend a week on the campus of the Dublin School in Dublin, New Hampshire. Dal Niente and the 10 participating faculty composers will hold rehearsals on Wednesday, July 10, and Thursday, July 11, open to anyone who wants to observe the creative process firsthand. The Faculty Commissioning Concert will be performed in the evening of July 12, 2019, for an audience of Walden faculty, staff, and students, and residents from throughout the region. The ensemble’s week-long residency offers an immersive collaborative process. All faculty composers and resident artists live on campus for the duration of the project, forming a close-knit creative community; artistic dialogue continues throughout the day and pieces evolve as they are carried from rehearsal to dining hall and back again. Composers and performers alike must be open-minded, adapting to and exhilarated by the project’s diverse offerings. The Ditson Fund was established at Columbia University in 1940, with a bequest of $400,000 from Alice M. Ditson, the widow of the noted Boston music publisher Oliver Ditson. Mrs. Ditson’s will stipulated that income from the bequest be used for non-academic fellowships, public concerts, and publications in support of music. The initial Advisory Committee appointed by Mrs. Ditson directed her intentions toward contemporary music. The Ditson Fund has continued this focus, with emphasis on funding of performances and recordings of music by emerging American composers. In 1945 the Ditson Conductor’s Award was established. It is the oldest continuing award honoring conductors for distinguished contributions to American music. Having awarded over 2,000 grants starting in 1940, the Ditson Fund continues to play an important role in support of contemporary American art music. Walden is honored to receive our first-ever grant from the Ditson Fund, whose dedication to contemporary music so closely intertwines with Walden’s mission. We are proud of this partnership to celebrate and support emerging composers. Walden’s 2018 Faculty Commissioning Concert featured six members of the International Contemporary Ensemble (ICE), premiering new works by 11 Walden faculty composers. You can listen to all of the pieces performed at this concert on Walden’s bandcamp page. "The audience at Friday’s Amos Fortune Forum was asked to do something that quite possibly no other audience has been asked to do in any of the 72 seasons the forum has been around. 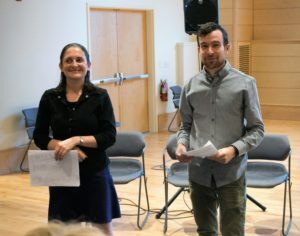 After his introduction, Walden School Executive Director Seth Brenzel told those in attendance to stand up, close their eyes, and link hands in a circle – which extended around the interior of the Jaffrey Meetinghouse." Check out Strings Magazine's March 2018 feature on Walden's Creative Musicians Retreat! Order the full issue online. The Walden School is proud to have been honored with a 2017 Ewing Arts Award at a ceremony held last month at the Redfern Arts Center at Keene State College. 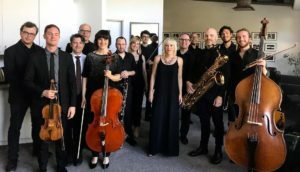 The International Contemporary Ensemble (ICE), described by the New York Times as “one of the most accomplished and adventurous groups in new music,” is dedicated to reshaping the way music is created and experienced. Hear world-premiere commissions written by Walden School Faculty Composers Katherine Balch, Alex Christie, Sky Macklay, Osnat Netzer, and Moshe Shulman. This dynamic program will include a diverse range of contemporary pieces for various instrumentations, including a work by Composer-in-Residence, Paula Matthusen, as well as works by Ted Hearne, Olga Neuwirth, Anthony Braxton, Erin Gee, and Sam Pluta. 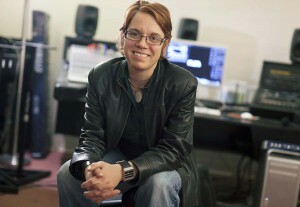 Award-winning composer and Professor of Music at Wesleyan University, Paula Matthusen’s works often consider discrepancies in musical space-real, imagined, and remembered. Dr. Matthusen will share stories and examples, speaking candidly about developing her musicianship and her experiences as a composer. Singing in chorus is a daily musicianship and community building event for everyone on campus at The Walden School. Making music all together is an important part of the Walden experience. Enjoy traditional and contemporary music from Norway, Estonia, England, Ireland, Bulgaria, and the US, along with madrigals by Wilbye and Monteverdi, and sacred works by Schütz, Rheinberger, and Zumaya. We're also bringing you improvisatory new music by Paula Matthusen, Amanda Feery, and Sam Pluta. You won't want to miss this culminating event. Walden's Executive Director will be hosting an alumni gathering after the concert. Let us know if you'd like to attend by writing to us atevents@waldenschool.org.